High-quality preschool programs have proven to help close these gaps both for individual student subgroups in a school and for the school as a whole. This new resource, produced by the Center on School Turnaround at WestEd and the Center on Enhancing Early Learning Outcomes, examines case studies of three schools that have used School Improvement Grant funds to implement early learning strategies as part of their turnaround models. 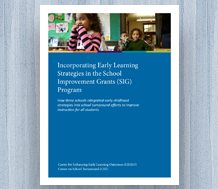 Visit the Incorporating Early Learning Strategies in the School Improvement Grants (SIG) Program: How Three Schools Integrated Early Childhood Strategies Into School Turnaround Efforts to Improve Instruction for All Students resource page to learn more and download a free copy.